You’ll not see these fellas in Montrose of course, as this part of Scotland is regarded as the statue capital of the Angus region, so they’ve got plenty of the real thing for pigeons and gulls to settle upon and befoul. Montrose’s long High Street is home to several of them. At the southern end is James Graham, the 1st Marquis of Montrose, stood with his sword pointing at an awkward angle into the ground suggesting he’s picking up bits of stray litter with its spike, his left arm crooked at the elbow like a teapot and his hair fashioned to look as matted as dreadlocks on a tramp. Further along is Robert Peel, marking the position of the Burgh Tollbooth, managing to look manly whilst appearing to clutch a swiss roll. It may well be a spooled collection of important papers in actuality, but I prefer the idea that Sir Bob kept a tight grip on his cake. Next is one of many by local sculptor William Lamb, this work entitled ‘Bill the Smith’, a chap who is captured looking into the middle distance, as though his eyes are mournfully following a too rapidly shut train door disappear towards the horizon trailing half of his cardigan. Then there is Joseph Hume who appears to either be pressing a defiant finger down on some Parliamentary papers, or trying to get the ‘volume up’ button on his TV remote to work. With these and the view of the Montrose Basin from the station platform, this east coast town is a whole lot tidier and quainter than you might expect (if, like me, you are a man of prejudice). The name ‘Montrose’ apparently comes from ‘Mouth Hrossay’ due to its location at the outlets of the River Esk near Rossie Island, which is the Norse for horse island. Thus, reading between the lines, everything I write in this piece comes literally, to an extent, from the horse’s mouth. 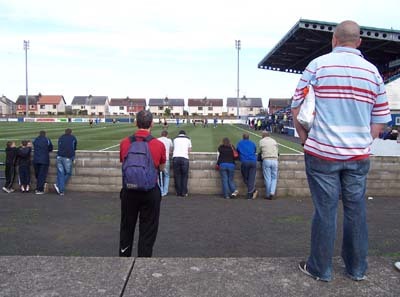 However, when I first picked this match out as my chosen one for this holiday jaunt, whilst the Montrose side of things was fixed, the opposition were not. 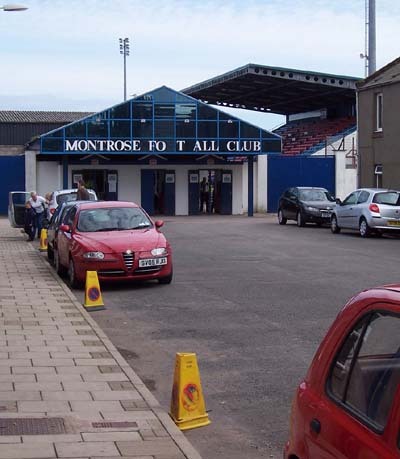 In the fixtures press release, this game was listed as Montrose vs Club X, suggesting Super Mo would be lining up against three exotic dancers, seven Nuts-reading misogynists and a mac-wearing pensioner with yesterday’s crumbs in his stubble. However, after the Scottish League’s hooded cabal undertook their summer vote, Club X’s slags and masturbators XI were duly replaced by Annan Athletic. Prior to this game, Annan were enjoying a successful relationship with Scottish League football that mirrored that twixt rat and drainpipe. However, despite being their ticket in to the senior game, Gretna’s demise hangs over their potential like a cackling spectre. If Annan do continue their beginner’s luck, you would imagine it won’t come as a result of a Brewster’s Millions style gush. That said there is one clear connection between the two clubs in the form of Derek Townsley who played for Gretna not only in the Scottish Cup Final and Premier League, but also back in their south-of-the-border-down-Northern-Premier-League-way days, and is now turning out just along the A75. Their support are already clearly excited about making the step up, bringing quite a few across from the western border country, some of them with flags, others with ladies wedding hats they seem rather over keen to sport. This brash optimism is rather at odds with Montrose’s choice of PA music – some esoteric guitar and synth pop filtering through, it's melancholia indicative of some admirably catholic tastes up in the box, but also perhaps a sense of world-wearied pessimism as to the nature of the season they are expecting. Scottish refs may well feel just as resigned, given the Scottish League still insist on making them look as ridiculous as possible, their all-over neon yellow ensemble not exactly a winner in terms of sartorial élan. A good ref is one that doesn’t draw attention to himself, but that becomes difficult when you’re kitted out like a giant highlighter pen. 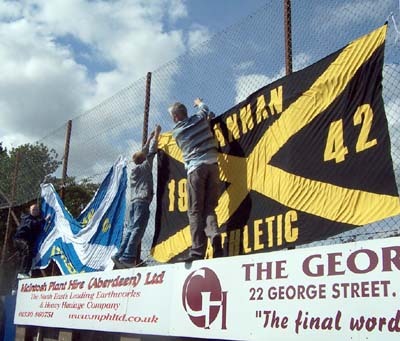 During the opening exchanges, as Annan fans adjusted their flags whilst clinging on to the tall wire fence, Montrose fans crying out “they’re trying to get out already!” and “turn it on!”, the away side were looking much the stronger, much to the chagrin of the Gable Enders. “Go on you English cooonts” came the bellow, the last syllable being elongated for effect to the point where it was still ongoing as Mike Jack’s free-kick pinged back off the Montrose crossbar. 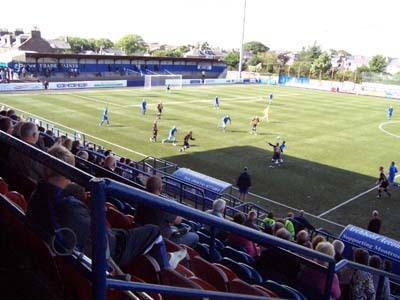 This inspired Montrose to get amongst the game a little more and subsequently both Steven Doris and Hugh Davidson fashioned chances, before eventually they went ahead in the 27th minute, Scott Anson running behind defender Stuart Hill and dropping a shot from 15 yards out over keeper Craig Summersgill and into the far corner. Gorgeous. Despite Darren Johnstone’s shot that was easily palmed away by keeper, and MI5 secret agent, A Trialist, Montrose were looking quite comfortable. They might have gone into the break even greater to the good but after the linesman spotted some shirt-pulling in the area, John Baird squandered his spot-kick, watching it crash back off the upright and away from danger [see pic above]. In the second period, the home side began once more on the front foot, causing Annan all sorts of trouble down the flanks, a cross into the mix getting stuck between Doris, Anson and a couple of Annan defenders. However it soon became clear that Montrose are a side quick to crumble. Annan sensibly and calmly kept the ball amongst themselves for long periods which induced a false panic amongst the home side. Annan gaffer Harry Cairney exploited this in the 71st minute by bringing on the fresh legs of Ryan Adamson and Graeme Bell. Within two minutes the former had crossed for the latter to head the equaliser. 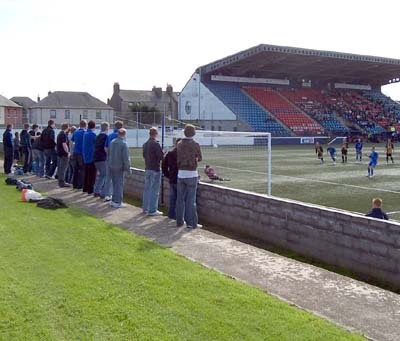 Frustrated by this and their side’s inability to kill off a game, the Montrose fans became quite grizzly, while Hugh Davison was red carded with ten minutes to go for lashing out at Johnstone with an elbow. After this both sides went close through Baird and Bell respectively but the score ultimately remained the same. On the final whistle the Montrose fans let out a discontented boo. The Annan supporters, on the other hand, celebrated remaining unbeaten by singing long after the rest of the ground had cleared.